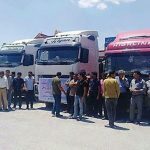 Truck driver’s strike on its 9th day. 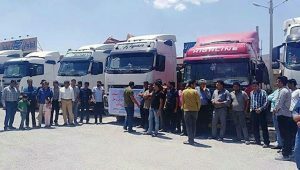 On Wednesday, May 30th, the truck drivers’ strike in Iran stretched to its ninth day. Drivers in 257 cities in 31 provinces began their latest strike on May 22nd. The strike has forced the closure of numerous businesses and has led to fuel shortages in urban areas. Disparities in load tones between common drivers and those with ties to the regime. The protests taking place across Iran have clearly demonstrated the people’s dissatisfaction with the current regime and their desire for regime change. As protests and strikes continue across the country, the regime has resorted to using force to respond to their just demands, in further attempts to suppress dissent from the people and prolong their rule. On Tuesday, May 29th, the National Council of Resistance of Iran (NCRI) reported on the regime’s response to the ongoing uprising currently taking place throughout Iran. The regime has become increasingly alarmed by the anger of the people and the steady stream of protests against the regime and its policies. Khamenei expresses this sense of desperation when he ordered the deployment of armed units to protect state offices and agencies from the people and their escalating protests. Efforts to suppress protests have largely failed, and the people of Iran are still gathering daily for multiple protests about a variety of issues.